One thing I love about the Calgary Stampede is that it’s okay to have booze for breakfast. Not every morning, mind you. But guaranteed, there will be at least one break of day during yyc’s annual rodeo drunk-fest where a little hair of the dog will be just what the doctor ordered. In anticipation of this yearly event, Bar C on 17th Ave. S.W. has come up with an appropriately breakfasty (and naturally, very boozy) cocktail called the Cowboy’s Breakfast, available daily through July 13. The Cowboy’s Breakfast is a Stampede cocktail available at Bar C through July 13. The Cowboy’s Breakfast features Buffalo Trace bourbon, Cazadores tequila, egg whites, bacon-infused maple syrup, cherry bark bitters and liquid smoke (evidently you can buy this, for that campfire taste) shaken together dry to emulsify the egg white, and then shaken with ice. The cocktail is garnished with candied bacon. I love how smooth and silky this drink is, and how it warms up an empty belly with bourbon and the sweet notes of maple, cinnamon and bacon. Its only downside is that, coupled with the bacon garnish, you may just order a second and third cocktail and skip breakfast altogether. Giddy up! Method: Combine all ingredients except garnish in a shaker and dry shake. Add ice and shake again. 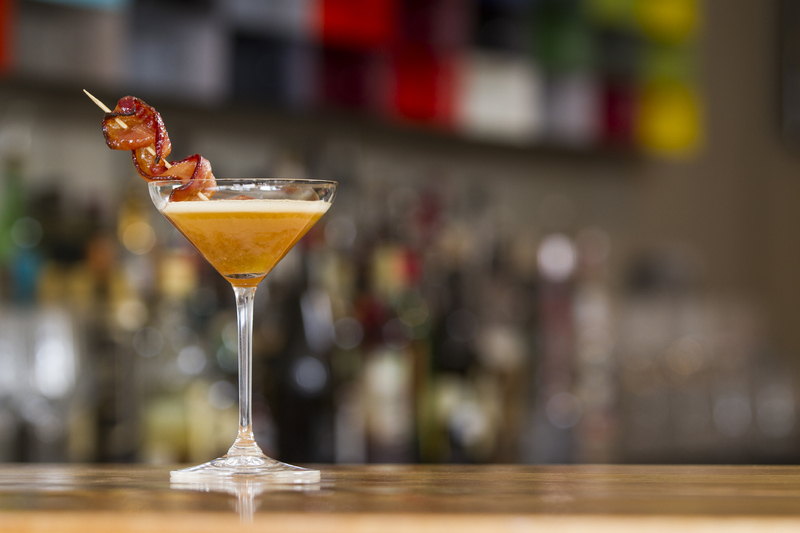 Fine strain into a chilled martini or coupe glass and garnish with a strip of candied bacon. This entry was posted in Cocktails and tagged bourbon cocktails, Calgary Stampede cocktail, Calgary Stampede drinks, Cowboy's Breakfast cocktail, Stampede breakfast cocktails, What do you drink during the Calgary Stampede?. Bookmark the permalink.